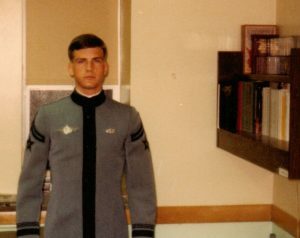 Eric McMillin and John Schoen were both commissioned by the United States Military Academy — also known as West Point — as Army second lieutenants on May 26, 1982. Now, 35 years later, they are both second-year law students at the University of Kansas School of Law. John Schoen graduated from West Point in 1982. Though McMillin and Schoen graduated from West Point at the same time, they were in different regiments and did not meet for the first time until after they had both retired from the military. At West Point, Schoen concentrated his studies on managerial psychology and was a member of the 3rd Regiment. McMillin concentrated on military history and was a member of the 4th Regiment. Eric McMillin graduated from West Point in 1982. He is now a second-year law student at KU Law. 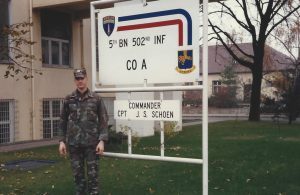 Schoen actively served in the U.S. Army for 28 years. 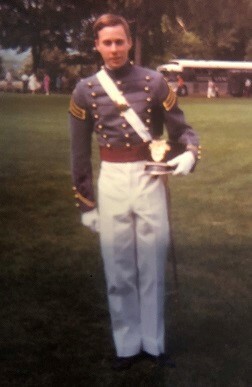 Throughout his career, he served as an infantryman for 12 years, led the White House platoon under President Ronald Reagan, commanded the Army drill team, did foreign area officer work, taught physical education for four years at West Point, served as an Army logistician and concluded his military career by serving on the operational staff at the North Atlantic Treaty Organization. 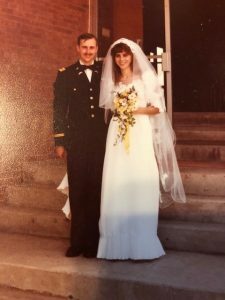 After retiring, he taught as a civilian assistant professor for seven years at the Army Command General Staff College (CGSC) in Leavenworth. 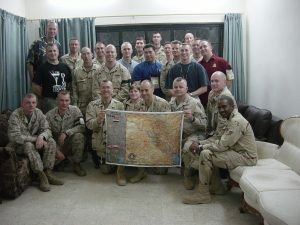 Through his service, he was deployed or assigned to roles in seven foreign countries: Afghanistan, Denmark, Egypt, Haiti, Iraq, Italy and West Berlin. 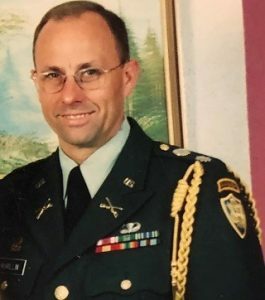 John Schoen commanded the Army drill team, while he was stationed in West Berlin in 1988. 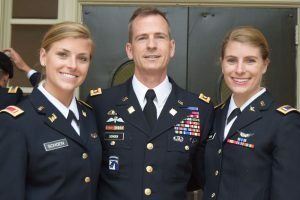 Schoen’s daughters have each followed in his footsteps by pursuing careers with the Army. His oldest daughter, Kacie, is a captain and a black hawk helicopter pilot. His middle daughter, Madison, is a lieutenant and combat engineer in Afghanistan. His youngest, Taryn, is a junior in the ROTC program at Wofford College and plans to serve in the Army after graduation. John Schoen served in the U.S. Army for 28 years and is now a second-year law student at KU Law. His daughter Kacie, right, is a captain and a black hawk helicopter pilot. His daughter Madison is a lieutenant and combat engineer in Afghanistan. “I think it’s a great start to adulthood for them,” Schoen said. McMillin’s time in the Army started and ended similarly to Schoen’s, but his career was very different. McMillin was deployed to Germany during the Cold War, commanded a tank company, was assigned to the foreign area officer program, learned Hebrew at the Defense Language Institute in Monterey, California, earned a master’s in Middle Eastern studies from the University of Chicago, advised Iraqi Ministry of Defense organizations in Iraq, served as a liaison officer in Israel, worked as an Army attaché in Israel, Jordan and the Palestinian Territories, and served in a cavalry unit. He retired from active duty to teach as a civilian assistant professor for 11 years at the CGSC. Eric McMillin, center, is pictured during his time in the Army. After rich and varied careers in the military, Schoen and McMillin both retired in 2017 and decided to go to law school at KU. Schoen’s interest in the law was piqued after many interactions with the legal system throughout his time in the Army. McMillin, similarly, gravitated toward pursuing a law degree after experiencing a lifelong fascination with the legal system. Eric McMillin, now a second-year law student at KU Law, formerly served in the U.S. Army. Schoen’s favorite part about going back to school has been what he’s learned in the classroom. 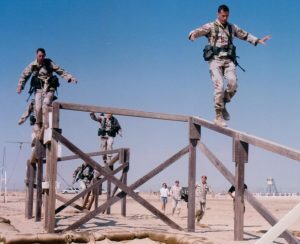 John Schoen, front, is pictured in Eygpt in 1998. 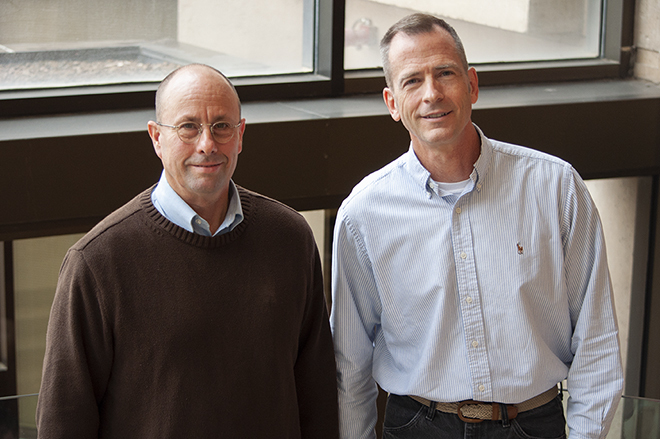 Schoen, 58, and McMillin, 57, are not in a rush to figure out their post-law school plans. McMillin is interested in the idea of becoming a general practice lawyer in a small community setting, while Schoen is looking into working in the areas of estate planning, trusts and elder law. Eric McMillin is pictured in his Army uniform on his wedding day. McMillin is happy to have ended up in Kansas to continue his education. Great story for posting on Veterans Day! I’m proud of the way KU Law supports the military through its students and programs to getting the word out about its alumni who serve on active duty and the reserves/National Guard. As the article notes, a great way to appreciate our rule of law is to experience countries and cultures not founded on or that have drifted from that most important foundational block.